Cybercriminals constantly seek new methods to monetize their attacks. Ransomware and CEO fraud have provided a very reliable source of income in recent years, but the surge in cryptocurrency prices over the last 12 months has led to the development of a new method of generating funds -- cryptojacking. Instead of installing remote access Trojans or ransomware, cryptojacking hackers install cryptomining software onto vulnerable devices and steal their computing power to generate large volumes of cryptocurrency that can then be traded anonymously. Preventing this type of cloud cryptojacking attack requires an organization to examine its overall security maturity and cyber resilience. 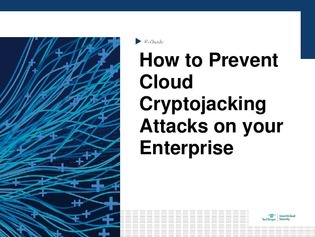 Discover the ways you can help prevent and detect cryptomining to stop your organization from falling victim to a cloud cryptojacking attack.